Directed by Lana and Lilly Wachowski. USA. 1999. 136 min. Twenty years ago, on March 31st, 1999, The Matrix entered the Hollywood universe and captured the imagination of a generation obsessed with Y2K. 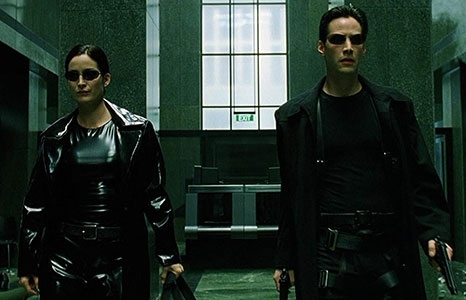 Combining age-old philosophies and mythologies with groundbreaking cinematic action and visual effects, The Matrix introduced new ways of looking at the world to the mainstream—and its resonance is still felt today. Keanu Reeves stars in this explosive sci-fi adventure about a man who comes to believe that his everyday world is the product of a computer-driven digital matrix that feeds on humans. Goon Lei Goon is a four piece indie rock band based in Honolulu. The band consists of two guitarists/vocalists (Dylan DeAngelo and Taylor Oishi), a drummer (Stephen Radkov) and a bass guitarist (Andre Gonzalez). Having met through skateboarding in their teen years, skate and surf culture have a strong impact on their music and aesthetics. They are influenced by present and past acts like New Order, The Rolling Stones, The 13th Floor Elevators, Surf Curse, Mac Demarco, and King Krule. Since they formed in 2017, Goon Lei Goon has performed for Sofar sounds, Mori, Polu Gallery, Aupuni Space and at popular Honolulu venues such as Hawaiian Brian's, Next Door, Downbeat Diner, and The Republik, where they opened for indie rock artist Mac Demarco. Doors open at 7pm. Film starts at 8pm.